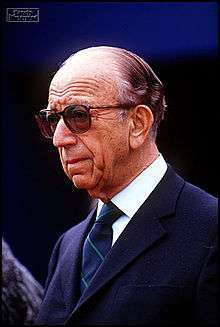 Leon Hess (March 14, 1914 – May 7, 1999) was the founder of the Hess Corporation and the owner of the New York Jets. Hess was born on March 14, 1914 to a Jewish family in Asbury Park, New Jersey. His parents were Ethel and Mores Hess, who was a kosher butcher who emigrated from Lithuania and - after arriving in the United States - worked as an oil delivery man in Asbury Park, New Jersey. Hess worked as a driver for his father's company and - after it went bankrupt in 1933 during the Great Depression - he reorganized the company. He built an oil terminal in Perth Amboy, New Jersey out of old oil tankers and aggressively underbid his competitors to win Federal oil contracts. He served in World War II, rising to the rank of Major, and serving as the fuel supply officer for General George S. Patton where he further developed his logistical expertise. After the war, using an innovative network of smaller terminals, Hess' success continued. In the late 1950s, he built his first refinery; and in 1960, he opened a chain of gas stations. In the early 1960s he built the world's largest oil refinery at the time on St. Croix in the United States Virgin Islands in order to take advantage of federal tax benefits. The refinery was able to secure foreign refiner status (allowing it to circumvent the federal rule that required the use of higher-cost U.S.-flagged vessels when shipping oil to the East Coast) while also receiving subsidies from the United States Department of Energy as a domestic refinery. In 1963, his company, Hess Oil and Chemical, went public. In 1969, using the proceeds from the Hess sale, he acquired the Amerada Petroleum Corporation, one of the largest producers of crude oil in the United States and - as part of the purchase - merged it with his former company, Hess Oil and Chemical - to form the Amerada Hess Corporation. Hess served as chairman and CEO of Amerada Hess until 1995. In 1963, he was part of a consortium that bought the New York Jets which included Hess, Sonny Werblin, Philip H. Iselin, Townsend B. Martin and Donald Lillis. His initial investment was $250,000. He bought out his partners: Sonny Werblin in 1968, the heirs of Philip H. Iselin in 1977, Townsend Martin in 1981 and became the sole owner of the club after purchasing the last quarter-share from Helen Dillon, Lillis' daughter, in 1984. The Jets played in Shea Stadium in 1964 after four seasons in the Polo Grounds. In 1984 Hess moved the team to Giants Stadium in East Rutherford, New Jersey. When he owned the Jets, he would eat dinner after almost every home game at Lusardi's. In 1947, he married Norma Wilentz who was also Jewish. Wilentz's father was the former Attorney General David T. Wilentz who prosecuted Bruno Richard Hauptmann in the Lindbergh baby kidnapping case. They had three children: Marlene Hess Zirin, Constance H. Williams, and John B. Hess. His daughter Marlene is married to lawyer, writer and cable TV talk show host, James D. Zirin. Hess died at Lenox Hill Hospital on May 7, 1999 from a "blood disease". In 2011, Hess was inducted into the New Jersey Hall of Fame. In 2014, the New York Jets selected Hess, along with former WR Wayne Chrebet, to be the year's inductees into its Ring of Honor. The Leon Hess Business School at Monmouth University and the Leon and Norma Hess Center for Science and Medicine were named for him. 1 2 "Leon Hess". Sports Illustrated. May 7, 1999. Retrieved 2011-11-19. 1 2 Gola, Hank (January 12, 2000). "Hess Family Hits Gusher In Jet Sale". Daily News. New York. ↑ "Sonny Werblin, an Impresario of New York's Sports Extravaganza, Is Dead at 81". The New York Times. November 23, 1991. ↑ Sandomir, Richard (January 14, 2000). "SPORTS BUSINESS; For Hess's Estate, It's a jets.com". The New York Times. ↑ Mike Freeman (October 17, 2000). "ON PRO FOOTBALL; New York Teams Taking Different Paths to the Same Destination". New York Times. Retrieved January 10, 2013. ↑ "Leon Hess". New York Times. May 9, 1999. Retrieved 2007-02-14. Peacefully on May 7, 1999 of complications from a blood disorder. Beloved husband of Norma; cherished father of Constance and Dr. Sankey Williams, Marlene Hess Zirin, and James Zirin, John and Susan Hess; adored grandfather of Elizabeth and Jennifer Williams, Peter and Margaret Friedland, Michael, David and William Hess; dear brother of Betty Gilbert, dear brother-in-law of Ruth Hess, Warren and Rhoda Wilentz and the late Robert and Jacqueline Wilentz, treasured son of the late Ethel and Mores Hess and son-inlaw of the late Lena and David T. Wilentz. ↑ Lange, Randy. "Leon Hess, Wayne Chrebet to Join Ring of Honor". New York Jets. Retrieved 9 Jan 2015.